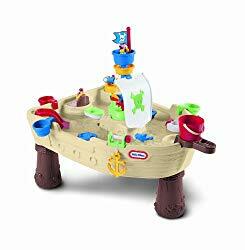 Great deal on this Little Tikes Anchors Away Pirate Ship water table - save almost $20! My kids enjoyed their water table for years! They would play with it all summer long, then as the cooler weather approached I would bring the table indoors to fill with rice, beans, or dry pasta. I would bury fun treasures in the dry ingredients for the kids to have to find.